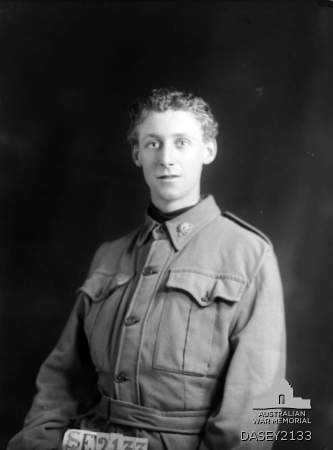 Carlton born, Alexander Farrow served his country in two world wars, and played VFL football for both Melbourne and Carlton in a career spanning 47 games. A clever centreman who twice represented Victoria while playing at Melbourne, he came to Princes Park as a forward in the twilight of his career and averaged a goal a game in his 14 appearances. Farrow was attracted to the military during his schooldays, and so enlisted to fight in World War 1 as soon as he turned 18. Trained as a signaller, he spent the last two years of the conflict in the Middle East – where, like many of the Aussie troops, he took every opportunity he could to kick a football. The carnage finally ended in November 1918, but Alec had to wait until April of the following year to be given a passage home. While easing back into civilian life, Farrow turned up at Melbourne late in the 1919 season. The Redlegs were short of numbers, and welcoming anyone with football ability. With Farrow, they struck gold. A sure ball-handler at ground level, Alec had an uncanny ability to read the ball as it spilt from packs. His disposal was always accurate, and he took a good mark for his size. Something of a sensation from his first appearance, he played in the middle in most of his 33 games, and represented Victoria in 1920 and ’21. Meanwhile, over at Princes Park, Carlton had lost the 1921 Grand Final to Richmond by four points, after finishing the year as minor premiers. Intent on immediate redemption, the Blues were looking everywhere for quality recruits in 1922, and so convinced Farrow that a change of football scenery could be beneficial. By then rising 28, he eventually agreed, and made his debut for Carlton in round six, against St Kilda at Princes Park. By the end of that afternoon, Alec must have wondered what he had blundered into. The game was a shambles, on the field and off. Enraged by some contentious umpiring, and spiteful incidents off the ball, the home crowd threw rocks at the St Kilda players and attacked a boundary umpire and the police, as the match almost degenerated into a riot. Farrow’s two goals from a half-forward flank in Carlton’s win by 11 points was one of the few positives on a sad day for the game. Happily, things improved rapidly for Alec as the year progressed. His twelve games for the season produced 12 goals and the thrill of his first finals appearance. However, for the second year in a row, the Blues were knocked out of flag contention by less than a goal, when Essendon scored in the last minute of the 1922 Semi Final to beat Carlton by 5 points. Farrow’s career lasted just two more games after that high point, ending with a sickening collision with a Richmond opponent at Punt Road Oval in May, 1923. In a typically willing clash between two fierce rivals, Alec and his adversary clashed heads in a ground level contest, and both were taken from the field unconscious. At first it was feared that Farrow had sustained a fractured skull, but it was later confirmed as severe concussion. On the same afternoon another Blue; Frank Martin, suffered a compound fracture of an arm, and both men didn’t play VFL football again. Almost twenty years later, when the world was once again plunged into a global war, Alec volunteered a second time to serve his country – in the blue serge uniform of the RAAF. He was restricted by his age to duty within Australia, but rose to the rank of Corporal before his final discharge in January, 1948. Seven years later, on September 15, 1955, he died at the age of 61. Farrow originally played with Carlton District, then the Army, prior to entering the VFL ranks with Melbourne, and later Carlton. Contributors to this page: Bombasheldon , Jarusa , molsey , PatsFitztrick , tmd1 , true_blue24 , TruBlueBrad and admin . Page last modified on Sunday 26 of May, 2013 21:18:34 AEST by Bombasheldon.